Justin Bieber has achieved huge success in short span. His proficiency and calibre have taken him to unparalleled heights. He is a successful, handsome, and immensely talented celebrity, who is an inspiration for many. We are lucky to have witnessed his maturity and commitment to music. The best part of Bieber is that even after reaching the height of success he keeps room for personal improvement. "I grew up in a really small town with not a lot of money, and I liked singing, but it was just something that was a hobby"
"I'm crazy, I'm nuts. Just the way my brain works. I'm not normal. I think differently. My mind is always racing." Bieber is carries a vividly expressed sharp and candid conversation. His words compel the listeners to follow his deeds in order to become a better person. His words are not only appreciative but also worth following. In one of his interviews, he spoke that he wants people to connect with him through his work. Following his words of wisdom, one is sure to turn himself into a better and a successful human being. 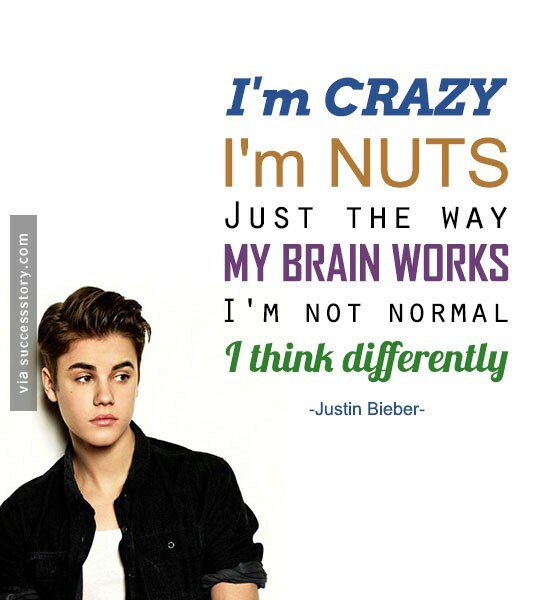 He has always portrayed himself as a family loving person and this can be seen in Justin Bieber quotes from songs. His strength is his family and friends. It is all that really matters to him. There is always something to learn from great personalities, and Bieber is one of them. He has always tried to come up with something new and extraordinary. Bieber too has met several failures, but at the end he could possibly generate something genius with them. It is all about the spirit of becoming even more successful. Quotes from such great personalities always bring something that is worth learning and can help us in attaining success in our lives. It is always a treat to go through Justin Bieber quotes from song lyrics.